The data analytics company, IC Insights, is in the process of completing its forecast and analysis of the IC industry and will present its new findings in The McClean Report 2019, which will be published later this month. Among the semiconductor industry data included in the new 500-page report is an analysis of the correlation between IC market growth and global GDP growth. The figure below depicts the increasingly close correlation between worldwide GDP growth and IC market growth through 2018, as well as IC Insights’ forecast through 2023. Over the 2010-2018 timeframe, the correlation coefficient between worldwide GDP growth and IC market growth was 0.86 (0.91 excluding memory in 2017 and 2018), a strong figure given that a perfect positive correlation is 1.0. In the three decades previous to this time period, the correlation coefficient ranged from a relatively weak 0.63 in the early 2000s to a negative correlation (i.e., essentially no correlation) of -0.10 in the 1990s. IC Insights believes that the increasing number of mergers and acquisitions, leading to fewer major IC manufacturers and suppliers, is one of major changes in the supply base that illustrates the maturing of the industry and has helped foster a closer correlation between worldwide GDP growth and IC market growth. 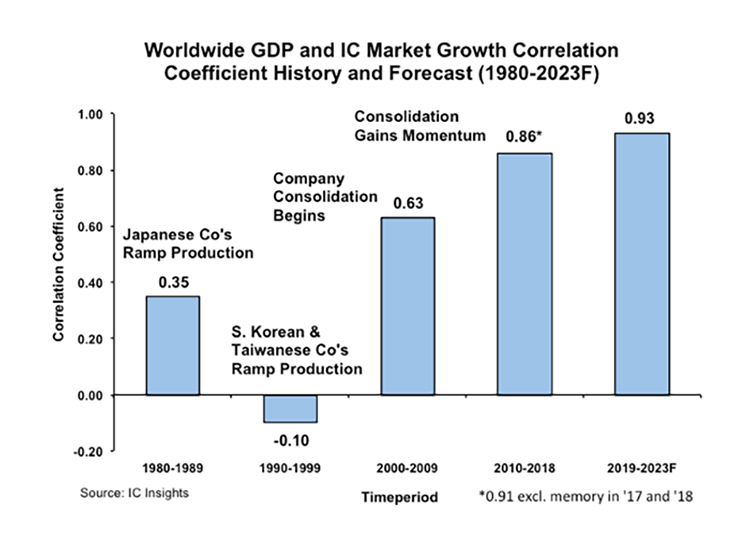 Another reason for a better correlation between worldwide GDP growth and IC market growth is the continued movement to a more consumer driven IC market. IC Insights believes that 20 years ago, about 60% of the IC market was driven by business applications and 40% by consumer applications with those percentages being reversed today. As a result, with a more consumer-oriented environment driving electronic system sales, and in turn IC market growth, the health of the worldwide economy is increasingly important in gaging IC market trends.